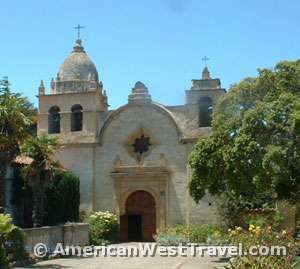 The Monterey County Spanish Missions Section of the California Central Coast Travel Guide features Carmel's Mission San Carlos Borromeo de Carmelo and Mission San Antonio de Padua in remote Jolon. All of the missions have been to some extent restored and are open to visitation today. Some continue to be working churches. Each brings alive the early history of California. Many also feature beautiful buildings and furnishings and displays of artifacts from the past. Mission San Carlos Borromeo de Carmelo, or Mission Carmel was the second mission founded, in 1770. 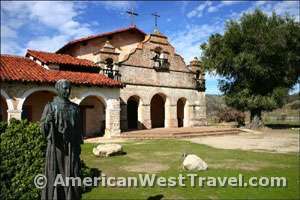 It was Father Junipeor Serra's headquarters for his California missionary work, and where he was buried upon his death in 1784. As with most of the missions, Mission Carmel fell into disrepair following secularization in 1834 and was actually roofless for thirty years. Repairs were started in 1884, and the most recent - and authentic - restoration started in the 1930s. Many believe this is the most beautiful of the Franciscan missions. Mission San Antonio de Padua was the third California mission founded, in 1771. Located in the Los Robles Valley the missionaires were well received by the natives. The San Antonio River provided plentiful water with a dam and aqueducts. The water turned the first California gristmill, where wheat was ground into flour. Much of this early water system, along with the gristmill, are still there today. Because of its remote location, the mission was heavily plundered after the 1834 secularization and completely abandoned from 1882 to 1928. Some restoration started in 1903 with more modern restorations started in 1948. The mission now accurately depicts the original mission in 1813. The mission has a museum and gift shop which are both open daily. It is also an active parish with Sunday mass and other events. The mission is within Fort Liggett but the gate is not staffed. See the Mission San Antonio de Padua's website for details, schedules and directions. From California Highway 1 about five miles south of Lucia, take the Nacimento-Fergusson Road east. From US-101 : Exit at Fort Hunter Liggett/Jolon Road. Proceed 26 miles to Fort Hunter Liggett Reserve (the gate is not staffed). Turn left and proceed 5 miles to the mission. Mission Nuestra Señora de la Soledad was founded by the Franciscan order on October 9, 1791 to convert the Native Americans living in the area to Catholicism. It was the thirteenth of California's Spanish missions, and is the namesake of the city of Soledad. After the 1835 secularization of the mission and the later sale of building materials, the mission fell into a state of disrepair and soon after was left in ruins. A restoration project began in 1954 and a new chapel was dedicated in 1955. The chapel now functions as a chapel of Our Lady of Solitude, a parish church of the Diocese of Monterey. The priests' residence was later recreated, and functions as a museum.